“In 2016 I decided to ‘retire’ my original 1975 White Falcon which had long been known as the ‘Sanctuary’ Falcon due to it being my weapon of choice from way back in the 1980s for both recording and playing live with The Cult. After many years of faithful service the ‘old girl’ had developed a beautiful patina with the white lacquer creamed with age and the gold plating on the metalwork worn away to reveal the silver coloured metal below but the value of this guitar (both monetary and sentimental ) meant I wasn’t comfortable touring with it anymore. 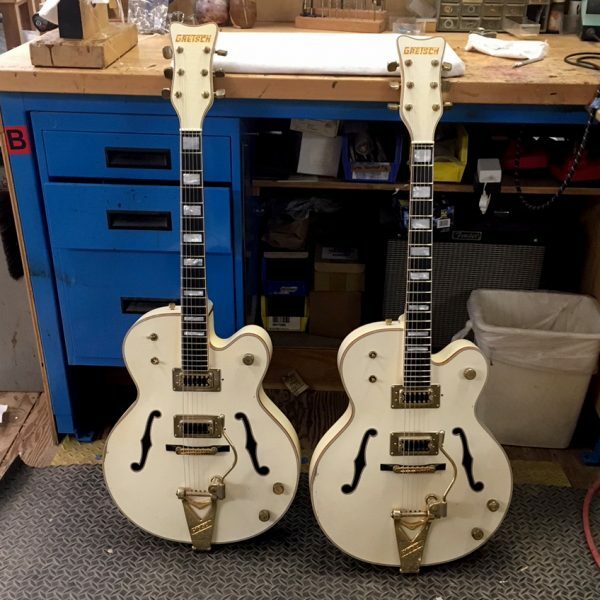 By this point I was happy to do so as my Signature White Falcon looks and sounds fantastic but after a while I missed having the ‘Sanctuary’ Falcon in my live arsenal so approached legendary Gretsch luthier Stephen Stern to make me two exact copies of my 1975 original. 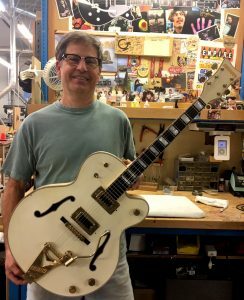 Stephen did an amazing job with every scratch and dent replicated on a guitar with all the ‘works’ of a brand new model so the perfect combination.